The National Geospatial-Intelligence Agency (NGA) is a combat support agency under the United States Department of Defense and a member of the United States Intelligence Community, with the primary mission of collecting, analyzing, and distributing geospatial intelligence (GEOINT) in support of national security. NGA was known as the National Imagery and Mapping Agency (NIMA) until 2003. NGA headquarters, also known as NGA Campus East, is located at Fort Belvoir North Area in Virginia. The agency also operates major facilities in the St. Louis, Missouri area, as well as support and liaison offices worldwide. The NGA headquarters, at 2.3 million square feet (214,000 m2), is the third-largest government building in the Washington metropolitan area after The Pentagon and the Ronald Reagan Building. "Know the Earth... Show the Way... Understand the World"
U.S. mapping and charting efforts remained relatively unchanged until World War I, when aerial photography became a major contributor to battlefield intelligence. Using stereo viewers, photo-interpreters reviewed thousands of images. Many of these were of the same target at different angles and times, giving rise to what became modern imagery analysis and mapmaking. The Engineer Reproduction Plant was the Army Corps of Engineers's first attempt to centralize mapping production, printing, and distribution. It was located on the grounds of the Army War College in Washington, D.C. Previously, topographic mapping had largely been a function of individual field engineer units using field surveying techniques or copying existing or captured products. In addition, ERP assumed the "supervision and maintenance" of the War Department Map Collection, effective April 1, 1939. With the advent of the Second World War aviation, field surveys began giving way to photogrammetry, photo interpretation, and geodesy. During wartime, it became increasingly possible to compile maps with minimal field work. Out of this emerged AMS, which absorbed the existing ERP in May 1942. It was located at the Dalecarlia Site (including buildings now named for John C. Frémont and Charles H. Ruth) on MacArthur Blvd., just outside Washington, D.C., in Montgomery County, Maryland, and adjacent to the Dalecarlia Reservoir. AMS was designated as an Engineer field activity, effective July 1, 1942, by General Order 22, OCE, June 19, 1942. The Army Map Service also combined many of the Army's remaining geographic intelligence organizations and the Engineer Technical Intelligence Division. AMS was redesignated the U.S. Army Topographic Command (USATC) on September 1, 1968, and continued as an independent organization until 1972, when it was merged into the new Defense Mapping Agency (DMA) and redesignated as the DMA Topographic Center (DMATC) (see below). The agency's credit union, Constellation Federal Credit Union, was chartered during the Army Map Service era, in 1944. It has continued to serve all successive legacy agencies' employees and their families. After the war, as airplane capacity and range improved, the need for charts grew. The Army Air Corps established its map unit, which was renamed ACP in 1943 and was located in St. Louis, Missouri. ACP was known as the U.S. Air Force Aeronautical Chart and Information Center (ACIC) from 1952 to 1972 (See DMAAC below). A credit union was chartered for the ACP in 1948, called Aero Chart Credit Union. It was renamed Arsenal Credit Union in 1952, a nod to the St. Louis site's Civil War-era use as an arsenal. Shortly before leaving office in January 1961, President Dwight D. Eisenhower authorized the creation of the National Photographic Interpretation Center, a joint project of the CIA and US DoD. NPIC was a component of the CIA's Directorate of Science and Technology (DDS&T) and its primary function was imagery analysis. NPIC became part of the National Imagery and Mapping Agency (now NGA) in 1996. NPIC first identified the Soviet Union's basing of missiles in Cuba in 1962. By exploiting images from U-2 overflights and film from canisters ejected by orbiting Corona (satellite)s, NPIC analysts developed the information necessary to inform U.S. policymakers and influence operations during the Cuban Missile Crisis. Their analysis garnered worldwide attention when the Kennedy Administration declassified and made public a portion of the images depicting the Soviet missiles on Cuban soil; Adlai Stevenson presented the images to the United Nations Security Council on October 25, 1962. The Defense Mapping Agency was created on January 1, 1972, to consolidate all U.S. military mapping activities. DMA's "birth certificate", DoD Directive 5105.40, resulted from a formerly classified Presidential directive, "Organization and Management of the U.S. Foreign Intelligence Community" (November 5, 1971), which directed the consolidation of mapping functions previously dispersed among the military services. DMA became operational on July 1, 1972, pursuant to General Order 3, DMA (June 16, 1972). On Oct. 1, 1996, DMA was folded into the National Imagery and Mapping Agency – which later became NGA. DMA was first headquartered at the United States Naval Observatory in Washington, D.C, then at Falls Church, Virginia. Its mostly civilian workforce was concentrated at production sites in Bethesda, Maryland, Northern Virginia, and St. Louis, Missouri. DMA was formed from the Mapping, Charting, and Geodesy Division, Defense Intelligence Agency (DIA), and from various mapping-related organizations of the military services. DMAHC was formed in 1972 when the Navy's Hydrographic Office split its two components: The charting component was attached to DMAHC, and the survey component moved to the Naval Oceanographic Office, Bay St. Louis, Mississippi, on the grounds of what is now the NASA Stennis Space Center. DMAHC was responsible for creating terrestrial maps of coastal areas worldwide and hydrographic charts for DoD. DMAHC was initially located in Suitland, Maryland, but later relocated to Brookmont (Bethesda), Maryland. DMATC was located in Brookmont (Bethesda), Maryland. It was responsible for creating topographic maps worldwide for DoD. DMATC's location in Bethesda, Maryland is the former site of NGA's headquarters. DMAHC and DMATC eventually merged to form DMAHTC, with offices in Brookmont (Bethesda), Maryland. DMAAC originated with the U.S. Air Force's Aeronautical Chart and Information Center (ACIC) and was located in St. Louis, Missouri. NIMA's logo, seal, and flag. NIMA's creation was clouded by the natural reluctance of cultures to merge and the fear that their respective missions—mapping in support of defense activities versus intelligence production, principally in support of national policymakers—would be subordinated, each to the other. The cost of the new center, as of March 2009, was expected to be $2.4 billion. The center's campus is approximately 2,400,000 square feet (220,000 m2) and was completed in September 2011. This table lists all Directors of the NIMA and NGA and their term of office. ^ Although General Clapper preferred the use of his military rank, he was in fact a member of the Defense Intelligence Senior Executive Service (DISES) during his term as Director of NIMA / NGA, as he had retired from active duty as the director of DIA in 1995. Clapper was the first civilian to head NIMA / NGA. On February 22, 2010, Secretary of Defense Robert Gates announced that Letitia Long would become director later that year, becoming the first woman to head one of the 16 Intelligence Community component agencies. Long was at the time deputy director of the DIA. Long was sworn in on August 9, 2010, as head of the NGA. Osama bin Laden Compound Raid:The NGA was integral in helping the Department of Defense and the U.S. Intelligence Community pinpoint the Osama bin Laden's compound in Abbottabad in Pakistan, where bin Laden was residing. Following identification, NGA worked in collaboration with other intelligence agencies to create a replica of Osama bin Laden’s home in Pakistan, map bin Laden's compound, analyze drone data, and help the SEALs simulate their mission. Osama bin Laden was then killed in a SEAL team operation. 9/11 aftermath: After the September 11, 2001 attacks, NIMA partnered with the U.S. Geological Survey to survey the World Trade Center site and determine the extent of the destruction. Olympic support: In 2002, NIMA partnered with Federal organizations to provide geospatial assistance to the 2002 Winter Olympics in Utah. NGA also helped support the 2004 Summer Olympics in Athens, Greece, and the 2006 Winter Olympics in Turin, Italy. Space Shuttle Columbia disaster: While the Space Shuttle Columbia was in orbit during STS-107, NIMA purportedly offered to image the shuttle and its suspected damage from falling debris during takeoff. NASA declined this offer (see Space Shuttle Columbia disaster), but has since forged an interagency agreement with NGA to collect imagery for all future space shuttle flights. Keyhole investment: NGA contributed approximately 25% of In-Q-Tel's funding of Keyhole Inc, whose Earth-viewing software became Google Earth. Hurricane Katrina: The NGA supported Hurricane Katrina relief efforts by "providing geospatial information about the affected areas based on imagery from commercial and U.S. government satellites, and from airborne platforms, to the Federal Emergency Management Agency (FEMA) and other government agencies. NGA's Earth website is a central source of these efforts. Microsoft partnership: Microsoft Corp. and the NGA have signed a letter of understanding to advance the design and delivery of geospatial information applications to customers. NGA will continue to use the Microsoft Virtual Earth platform (as it did for Katrina relief) to provide geospatial support for humanitarian, peacekeeping, and national-security efforts. Virtual Earth is a set of online mapping and search services that deliver imagery through an API. Social Software Training: Several agencies in the Intelligence community, most notably CIA and NGA, have developed training programs to provide time to integrate social software tools into analysts' daily work habits. These classes generally focus on the use of Intellipedia to capture and manage knowledge, but they also use other social software tools, such as blogs, RSS, and social bookmarking. The courses stress immersion in these tools, and instructors encourage participants to work on a specific project in Intellipedia and exposes participants to social media. Google and GeoEye: In 2008 the NGA partnered with Google and GeoEye. Google would be allowed to use GeoEye spy satellite imagery with reduced resolution for Google Earth. First Intelligence Agency to Open Source Software on GitHub: April 2014 NGA became the first intelligence agency to open-source software on GitHub. NGA Director Letitia Long talks about NGA's GitHub initiative and the first offering, GeoQ, at the GEOINT Symposium. Her comments start at 40 minutes and 40 seconds from her GEOINT 2014 conference speech. NGA open sources software packages under their GitHub organizational account. NIMA / NGA has been involved in several controversies. India tested a nuclear weapon in 1998 that reportedly took the United States by surprise. Due to budget cuts in defense spending after the end of the Cold War (see Peace dividend), the Intelligence Community was forced to reevaluate the allocation of its limited resources. In 1999, NIMA supposedly provided NATO war-planners with incorrect maps which did not reflect that the Chinese Embassy in Belgrade had moved locations, which some have argued was the cause of the accidental NATO Bombing of the Chinese embassy in Belgrade. The Central Intelligence Agency countered this criticism by saying this overstates the importance of the map itself in the analytic process. Maps of urban areas will be out-of-date the day after they are published, but what is important is having accurate databases. On Jan. 17, 2013, the USS Guardian was grounded on the Tubbataha Reef in the southern Philippines. The Navy investigated the cause of the accident and determined NGA was not at fault—rather, that the ship's leadership team failed to adhere to prudent, safe, and sound navigation principles. The Navy relied solely on an inaccurate Digital Nautical Chart (DNC) during the planning and execution of the navigation plan and failed to appropriately cross-reference additional charts and utilize visual cues. From 2013 to 2018, the NGA designated the latitude and longitude coordinates of a private residence as a default location for Pretoria, South Africa, causing the digital-mapping website MaxMind to set it as the location of over one million IP addresses, which in turn caused people searching for missing phones and other electronics (as well as other people trying to track down IP addresses in Pretoria and police officers attempting to track criminals) to show up at the residence. The issue was eventually resolved following a private investigation and a request to both the NGA and MaxMind that the default location to be changed. ^ "BRAC side effect: Greener buildings". May 13, 2011. ^ a b "NGA Campus East Fact Sheet" (PDF). Archived from the original (PDF) on February 21, 2014. ^ "Photo gallery: An alternative geography". projects.washingtonpost.com. ^ Frequently Asked Questions (FAQs) Archived November 24, 2013, at the Wayback Machine. .nga.mil. Retrieved on July 21, 2013. ^ Gellman, Barton; Greg Miller (August 29, 2013). "U.S. spy network's successes, failures and objectives detailed in 'black budget' summary". The Washington Post. Retrieved August 29, 2013. ^ "GSP - GSP". www.esa.int. ^ "Rear Adm. Robert Sharp USN confirmed as new NGA director". intelligencecommunitynews.com. December 28, 2018. Retrieved February 8, 2019. ^ "10 U.S. Code § 441 - Establishment". LII / Legal Information Institute. ^ Serbu, Jared (September 27, 2011). "Geospatial intelligence HQ is now DC's 3rd largest federal office building". Federal News Radio. Retrieved March 19, 2016. ^ "About NGA". Archived from the original on October 6, 2014. ^ Stirone, Shannon (September 7, 2018). "New Antarctica Map Is Like 'Putting on Glasses for the First Time and Seeing 20/20' – A high resolution terrain map of Earth's frozen continent will help researchers better track changes on the ice as the planet warms". The New York Times. Retrieved September 9, 2018. ^ "Constellation Federal Credit Union - Miscellaneous - CFCU to NCE". constellationfcu.org. Archived from the original on July 29, 2013. Retrieved December 3, 2012. ^ "Arsenal Credit Union - Arsenal Credit Union - Our Roots and Structure". Arsenalcu.org. Archived from the original on November 30, 2012. Retrieved November 27, 2012. ^ ""Solving the Mystery of the Arsenal Guns" by Randy R. McGuire". civilwarstlouis.com. Retrieved November 27, 2012. ^ "Thirty ... and thriving". Central Intelligence Agency. December 1, 1991. p. 1ff. Archived from the original on March 8, 2012. Retrieved May 30, 2010. ^ "Jan. 18, 1961: National Photographic Interpretation Center". www.nga.mil. ^ Nixon, Richard (November 5, 1971). "Memorandum, Subject: Organization and Management of the U.S. Foreign Intelligence Community" (PDF). gwu.edu. Retrieved August 12, 2007. ^ "Defense Mapping Agency". NGA.mil. ^ U.S. National Archives. "Guide to Federal Records: Records of the Defense Mapping Agency (DMA)". National Archives and Records Administration (NARA). Retrieved August 12, 2007. ^ "National Defense Authorization Act for Fiscal Year 1997" (PDF). September 23, 1996. Retrieved February 10, 2008. ^ "NGA: September-October 2003 State of the Agency" (PDF). Archived from the original (PDF) on September 19, 2009. ^ "Gates names first woman to head major intel agency". FederalTimes.com. February 23, 2010. Retrieved February 25, 2010. Letitia Long, currently the Defense Intelligence Agency's deputy director, will take over NGA this summer, Gates said. ^ "Woman takes charge of major intelligence agency for the first time". CNN. August 9, 2010. Retrieved August 11, 2010. ^ Ambinder, Marc (May 5, 2011). "The Little-Known Agency That Helped Kill Bin Laden". The Atlantic Monthly. ^ "Osama bin Laden Compound Raid". National Geospatial-Intelligence Agency. Retrieved July 27, 2017. This article incorporates text from this source, which is in the public domain. ^ a b "Oakland emails give another glimpse into the Google-Military-Surveillance Complex". PandoDaily. ^ "USS Guardian Grounding Investigation Results Released". U.S. Navy. Retrieved June 20, 2013. ^ Hill, Kashmir (January 9, 2019). "How Cartographers for the U.S. Military Inadvertently Created a House of Horrors in South Africa". Gizmodo. Retrieved January 10, 2019. Ambinder, Marc (May 5, 2011). "The Little-Known Agency That Helped Kill Bin Laden". The Atlantic. Explains the NGA's capabilities. Ensor, David (December 13, 2002). "Secretive map agency opens its doors". CNN. Aerospace Data Facility-East (ADF-E), also known as Area 58 and formerly known as Defense Communications Electronics Evaluation and Testing Activity (DCEETA), is one of three satellite ground stations operated by the National Reconnaissance Office (NRO) in the continental United States. 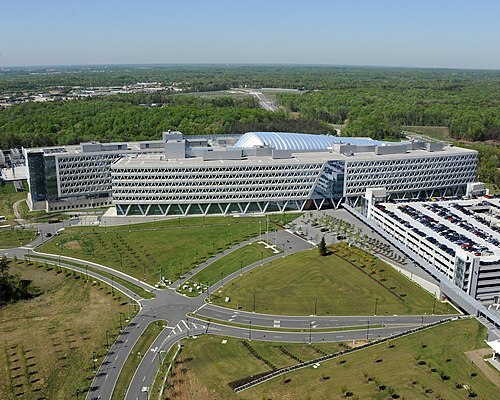 Located within Fort Belvoir, Virginia, the facility is responsible for the command and control of reconnaissance satellites involved in the collection of intelligence information and for the dissemination of that intelligence to other U.S. government agencies. Cacongo (Guilherme Capelo or Lândana) is a town in Cacongo municipality, Cabinda Province, in Angola. The former Landana municipality is now known as Cacongo, and the town is sometimes still known as Landana. It is located on Landana Bay about a kilometer south of the mouth of the Chiloango River. DAFIF () or the Digital Aeronautical Flight Information File is a comprehensive database of up-to-date aeronautical data, including information on airports, airways, airspaces, navigation data and other facts relevant to flying in the entire world, managed by the National Geospatial-Intelligence Agency (NGA) of the United States. Rear Admiral Edward A. Wilkinson of United States Navy was the Director Defense Mapping Agency from July 1983 to July 1985. He was also the Deputy Director of Defense Mapping Agency from July 1979 to May 1981. Frank J. Ruocco was fifth director of National Photographic Interpretation Center (NPIC) from February 1988 to February 1991. The GEOnet Names Server (GNS) provides access to the National Geospatial-Intelligence Agency's (NGA) and the U.S. Board on Geographic Names's (BGN) database of geographic feature names and locations for locations outside the United States. The database is the official repository of foreign place-name decisions approved by the US BGN. Approximately 20,000 of the database's features are updated monthly. The database never removes an entry, "except in cases of obvious duplication". Lieutenant General Howard W. Penney (December 5, 1918 – June 25, 2004) of United States army, was first director of Defense Mapping Agency from July 1972 to August 1974. Under Penney’s leadership, the new agency focused its assets into a decentralized structure with a lean staff to respond to the rising demands for geographic information by a variety of military users. Letitia A. Long served as a civilian in the U.S. Navy and the Intelligence Community between 1978 and 2014, retiring as the fifth Director the National Geospatial-Intelligence Agency, and the first woman to lead a major U.S. intelligence agency, in October 2014. She currently is the Chairman of the Board for the Intelligence and National Security Alliance (INSA). Nancy E. Bone is an American former intelligence officer who served as Director of National Photographic Interpretation Center between October 1993 and September 1996. Major General Robert "Rosie" A. Rosenberg (born 1934) of United States Air Force was Director of Defense Mapping Agency from July 1985 to September 1987. Throughout his 30-year career with the U.S. Air Force, he was instrumental to the U.S. satellite program. National Geospatial-Intelligence Agency inducted him into its Hall of Fame in 2005. Vice Admiral Robert B. Murrett was the fourth Director of the National Geospatial-Intelligence Agency, from 7 July 2006 through July 2010. In 2011, Murrett joined the Institute for National Security and Counterterrorism at Syracuse University where he now serves as deputy director. He is also a faculty member of the Maxwell School of Citizenship and Public Affairs, and serves on the IVMF advisory board at Syracuse University. Robert Cardillo was the sixth Director of the National Geospatial-Intelligence Agency and was sworn in October 3, 2014. He was previously selected by Director of National Intelligence James Clapper to serve as the first Deputy Director of National Intelligence for Intelligence Integration in September 2010. Clapper said in a statement that the position would "elevate information sharing and collaboration" between those who collect intelligence and those who analyze it. Cardillo previously served as Deputy Director of the Defense Intelligence Agency (DIA). Prior to that, he served as the Deputy Director for Analysis, DIA, and Director, Analysis and Production, National Geospatial-Intelligence Agency (NGA). Robert M. Huffstutler was director of National Photographic Interpretation Center from February 1984 to January 1988.At the time of his appointment as director of NPIC, Huffstutler was a twenty-five year veteran of Central Intelligence Agency, and head of the intelligence directorate's Office of Soviet Analysis. He had served in Office of Strategic Research from 1967 to 1982. Shannon D. Cramer Jr. (September 18, 1921 - February 15, 2012) was a retired U.S. Navy Vice Admiral. He was second director of the Defense Mapping Agency from September 1974 to August 1977. From April to September 1974, he was deputy director for Plans, Defense Intelligence Agency. Umivik is an abandoned settlement at Ammassalik Fjord. As of the winter of 1884–5, 19 Inuit lived there in a single dwelling. The U.S. National Geospatial-Intelligence Agency classifies Umiviik/Umîvik as a ruin at 65.65°N 37.2°W﻿ / 65.65; -37.2﻿ (Umivik), which is on the west side of Apusiaajik Island. Major General William K. James of United States Air Force, was director of the Defense Mapping Agency (DMA) between June 1990 and June 1993. Under his leadership Major General James redirected the DMA – a heritage organization of the National Geospatial-Intelligence Agency – from producing products to meet the requirements of the Cold War to a concept of a Global Geospatial Information System (GGIS) directly accessible to combat commanders of the Rapid Deployment Forces. The GGIS was a major paradigm shift in warfare with the delivery of geographic information to fast-moving military forces.